The ground breaking technology heralds a new age in BREEDPLAN genetic evaluation because it combines genomic (DNA) information with pedigree and performance records to calculate Estimated Breeding Values (EBVs). This development will lead to the best possible prediction of an animal’s breeding value for growth, fertility, carcase and eating quality traits. It will also provide certainty in regards to genetic pedigree. Australian Brahman Breeders Association CEO Robert Biddle said the ABBA had worked collaboratively over a long period with Meat and Livestock Australia (MLA), the Animal Genetics and Breeding Unit (AGBU) and the Agricultural Business Research Institute (ABRI) to develop the software. “You can’t tell the fertility of a bull just by looking at him, and while an animal may appear to be structurally correct, there’s a lot we can’t see,” Mr Biddle said. Breeders will be able to take a tail hair sample from an individual animal, send the sample for genotyping, and the genotype information will be included in the BREEDPLAN analysis to generate EBVs. Paul Williams, Tropical Beef Technology Services Technical Officer, said unlike the previous blended method of analysis, the new one-step methodology compared animals based on the actual genes they shared. 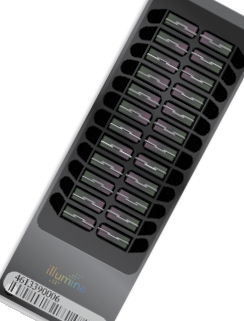 “The switch to Single Step analysis means that genomic information will contribute to not only the EBVs of the animal that has been genotyped, but will also inform the EBVs for the animal’s close relatives, such as grandparents, parents, progeny and siblings,” Mr Williams said. ABRI International Beef Recording Scheme manager Steve Skinner said more than 10,300 Brahman genotypes were currently on file and used to calculate EBVs. 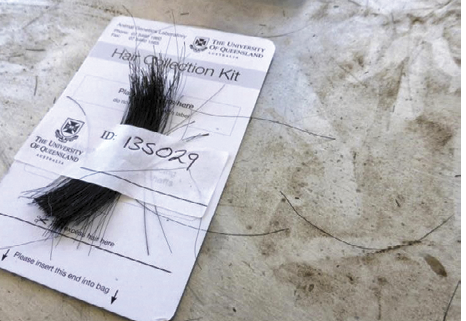 Tail hair collection kit and DNA chip. “As the number of genomic records increases in size and in coverage of the Australian Brahman population, the accuracy from genotypes will also continue to grow,” Mr Skinner said. Significantly, by using Single Step analysis EBVs can be generated for animals that do not have performance data or have not been measured for particular traits. This is especially important for calculating difficult to measure traits such as fertility or carcase. “Breeders will potentially have access to results for animals at a much younger age than was previously possible, and the resulting EBVs will be more accurate,” Mr Skinner said. The April Single Step BREEDPLAN analysis also saw the introduction of new trait data. Dr Robert Banks, AGBU director, said data for Age at Puberty and Lactational Anoestrus had been added and this data contributed to greater accuracy of the Days to Calving EBV. The introduction of a new male reproduction trait, Percent Normal Sperm (PNS) is another addition, with PNS measured as part of the bull breeding soundness evaluation at around two years of age. It is expected that sires with higher PNS EBVs will produce sons with higher PNS compared to sires with lower EBVs for this trait. An EBV for Carcase Intra Muscular Fat (IMF) has also been added to Brahman BREEDPLAN, and bases its calculations on measurements derived from abattoir data, rather than IMF scans. Mr Biddle said as well as predicting performance, Single Step analysis would allow unknown parents to be identified and unearth any discrepancies between paper pedigrees and genomic pedigrees. “To ensure that our records are one hundred percent accurate, we may need to ask members to re-sample animals to ensure DNA integrity, and we will be correcting pedigrees if discrepancies are found,” Mr Biddle said. For any questions about Single Step BREEDPLAN contact Paul Williams on 07 4927 6066 or Brahman BREEDPLAN on 02 6773 3555.